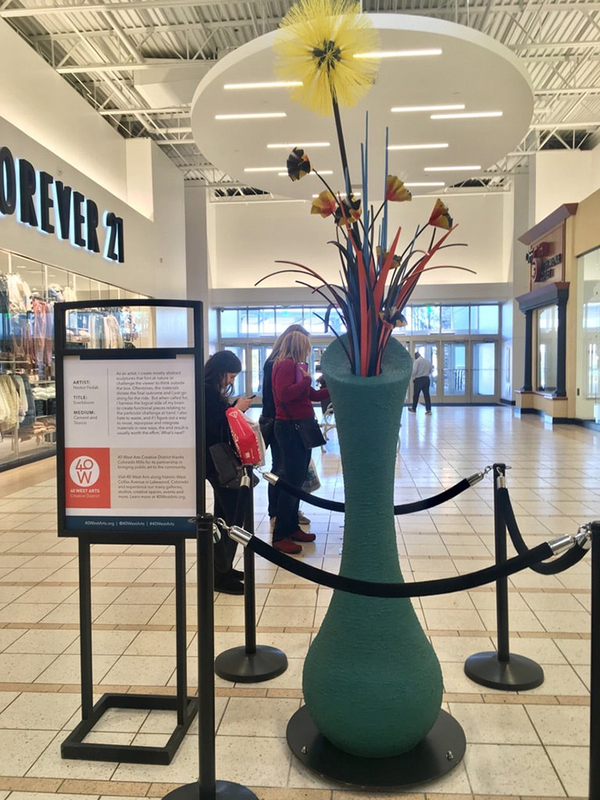 Two iconic Lakewood West Colfax businesses – Colorado Mills and 40 West Arts have partnered to bring art to the Mills mall! See sculptures and a new mural installation while you shop, featuring the following mentioned artists! Katy is an artist, designer, and permaculturist from Denver, Colorado. She paints vibrant murals, builds site-specific, interactive installations, and creates wooden wall sculptures based on patterns found in cultivated gardens and the wild. The main purpose of her art is to create joy and vitality by reconnecting people with nature. As an artist, I create mostly abstract sculptures that hint at nature or challenge the viewer to think outside the box. Oftentimes, the materials dictate the final outcome and I just go along for the ride. But when called for, I harness the logical side of my brain to create functional pieces relating to the particular challenge at hand. I also hate to waste, and if I figure out a way to reuse, repurpose and integrate materials in new ways, the end result is usually worth the effort. What’s next? I learned early to love the world of metal and machines. My father was a welder, body man, and jack of all trades and my earliest memories are of going into the garage to watch him work. The pleasures of working with my hands grew in high school during my favorite classes, industrial arts and potery. For over 30 years I’ve continued to master metal work while slowly building bigger, more complex pieces which are often inspired by the people around me. We thank Colorado Mills for their commitment to bringing public art to the community and our artists.